Synthetic Paper Market size is expected to exceed 200 kilo tons with growth rate at over 6% from 2016 to 2023. Strict regulatory norms against deforestation results into high demand for conventional resources which may favor the synthetic paper market size growth from 2016 to 2023. Global demand for paper increased by 400% over last 40 years including 35% of paper produced by harvested trees. Its sustainable production along with recyclable nature will positively drive the synthetic paper market in coming year. Global label and packaging was valued over USD 300 billion in 2015, and could exceed USD 400 billion in the next four years, with growth over 4%. These products are obtained through polymers such as high density and polypropylene which are refined products of crude oil. Decline in crude oil prices will positively impact its price trend. Growing demand for print and laminated material subject to high absorption property will spur the synthetic paper market share growth during forecast period. Positive outlook towards secure credential & Identity cards and e-passports application owing to water and chemical resistant property will further complement business growth in coming year. 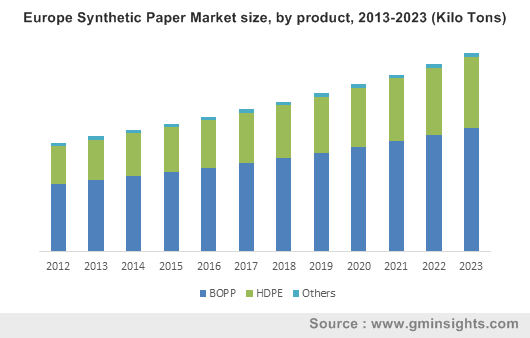 Synthetic paper market size demand from biaxially oriented polypropylene was valued over USD 100 million in 2015 and may witness growth over 6% by 2023. It offers high strength, clarity and make them appropriable for used as packaging material such as for fruits, fast food, confectionery, snacks and vegetables application. Superior biaxially oriented polypropylene offers ease of laminating, coating & printing to obtain desirable appearance and characteristics. Moreover, it is cost efficient along with excellent moisture barrier and superior strength properties when compared with other available alternatives. High density polyethylene synthetic paper market size is set to reach over 70 kilo tons by 2023. Label synthetic paper market size looks poised to exceed 50 kilo tons by 2023. It is used for stack labels, wraparound labels, shrink labels, in-mold labels and pressure sensitive labels. Non-label accounted for over 60 % of global synthetic paper market share in 2015. These products are primarily used for graphic arts, charts, banners and maps. It is also suitable for public and promotional print media. APAC synthetic paper market will exceed 150 million by 2023 with growth over 7% during the forecast period. Increasing demand from industries such as food & beverage, cosmetics, and chemicals subject to change in lifestyle trend will further complement the industry outlook in future. U.S. synthetic paper market size is predicted to reach over 40 kilo tons by 2023. Growing banner ads demand in the region will favor the industry growth over forecast period. Banner ads investment reached USD 7.9 billion in 2013 from USD 6 billion in 2010. Europe was valued over USD 60 million in 2015 owing to increasing demand from food and beverage industry. Latin America contributed over 5% of global synthetic paper market volume share in 2015 and should witness a decent growth from 2016 to 2023. Global synthetic paper market players include Blue, Octopus, Nan Ya Plastics Corporation, Yupo Corporation, American Profol, Reveal, PPG, DuPont, Hop, Neenah Papers, Arjobex, Taghleef. In this industry largest players holding half of the market share in 2015.This industry is concentrated in nature as largest players accounted for half of market share in 2015. Synthetic paper is manufactured by utilizing synthetic resin, derived from petroleum. Its characteristics is similar to plastic film characteristics and its appearance is same as paper obtained from wood pulp. It is environment friendly in nature. It has long life and offers waterproof property. It can also be fold without cracking. Positive outlook towards label and packaging industry will drive the industry growth during forecast period.